Location: Main Index » Forum Index » Chevrolet Cars 1958-1970 » 1965-1966 Fullsize Chevys » 65 2 door sedan headliner supplier? Could anyone here point me to a good headliner supplier? Possibly through actual experience? 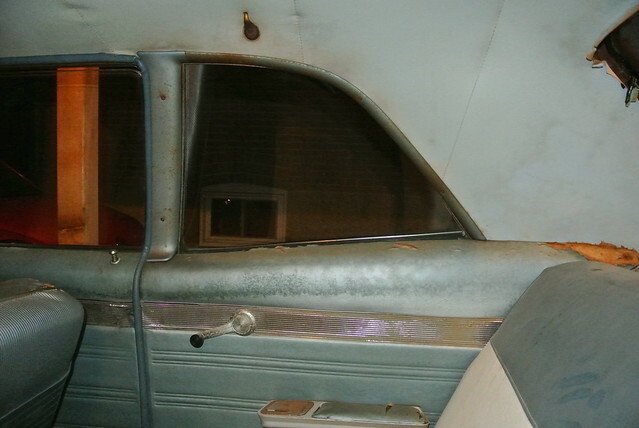 I'm looking for a pre made "Basketweave" pattern liner in Light Blue for my 65 Post Sedan. I have a fellow who installs, just need a good quality liner and I'll be good to go. Cliff, I think the Impala gets the star pattern. In the 65 Biscayne, Bel Air, Strato and Laurentian it's the Basketweave (I think). Funny how pale and faded the liner looks in the picture. I have a small sample from under the sunvisor mount, and unbelievably, it's the light blue just as pictured in the sample. 2 different headliner patterns is interesting. Funny things car makers do at times, just seems so unnecessary. I noticed you're in Ontario, so have you tried NOS Reproductions in Grand Bend? They were very knowledgeable about door panels when I talked to them. No headliners at NOS Cliff. I kept an original piece of my factory headliner when I removed it from my '65 Biscayne 2 door Post. Has the crayon marking from the upholstery dept on the back side. Nitrous is like a hot girl with STD's…You know you wanna hit it, but you’re afraid of the consequences! 1965 Biscayne 2 Door Post: 350,PG,373-posi,C3-DB, PS,PB. 1970 Chevelle Malibu: 53 on 753. Brian Daniel McClure: 1970-2015. R.I.P. Brother.